The Junior Lake Property, 100% owned by Landore Resources, together with the contiguous Lamaune Iron property (90.2% owned) (jointly the “Junior Lake Property”), consisting of 30,507 hectares, is located in the province of Ontario, Canada, approximately 235 kilometres north-northeast of Thunder Bay and is host to: The BAM Gold Deposit; the B4-7 Nickel-copper-cobalt-Platinum-Palladium-gold Deposit; the VW Nickel-Copper-cobalt Deposit; Lamaune Gold Prospect and numerous other precious and base metal occurrences. A highly prospective Archean greenstone belt traverses the Junior Lake Property from east to west for approximately 31 kilometres. The greenstone belt ranges from 0.5 to 1.5 kilometres wide and contains all of Landore Resources’ stated mineral resources and prospects. However, the greater proportion of this belt remains unexplored. The BAM Gold deposit, discovered in December 2015, is located approximately 2 kilometres to the east of the B4-7 deposit and 1 kilometre north of the VW deposit. The BAM Deposit is situated midway along a 2.7 kilometre long, east-southeast to west-northwest trending MaxMin geophysical anomaly (MM-7) located along a highly prospective Archean greenstone belt which traverses the Junior Lake Property from east to west for approximately 31 kilometres. 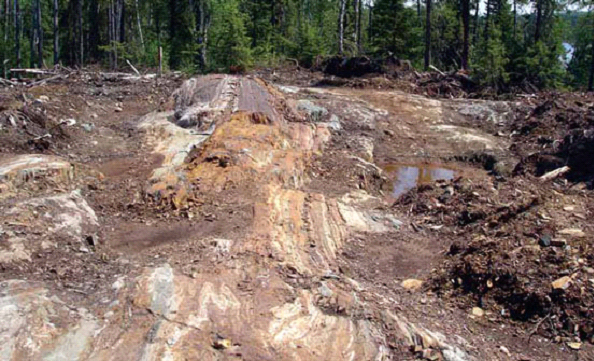 The favourable greenstone belt ranges from 0.5 to 1.5 kilometres wide and hosts multiple known gold occurrences including the Lamaune Gold Prospect. The recently updated Mineral Resource Estimate (MRE) released in January 2019 has significantly increased the BAM Gold resource to 28,826,000 tonnes (t) at 1.03 grams/tonne (g/t) for 951,000 ounces of gold including 20,198,000t at 1.08g/t for 701,000 ounces gold in the Indicated Category. In addition, the estimation work has also modelled potential mineralised material in target areas adjacent to the current delineated deposits for a possible 14,761,000t at 0.93g/t ounces gold for a further 441,000 ounces gold, in the ‘Unclassified’ material category. The BAM Gold deposit remains open to the east and west as well as at depth. The BAM Gold Deposit is interpreted as an Archean-aged mesothermal gold deposit. Findings from drilling to-date on the BAM Gold deposit revealed a lithological sequence consisting of leucogabbro and gabbro of the Grassy Pond Sill to the south, metasedimentary rocks of the BAM Sequence in the central portion, to mafic volcanics to the north. All lithological units have been subjected to variable shearing and deformation, markedly the metasedimentary unit. The deposit consists of gold mineralisation that is hosted by sheared and altered rocks of the Grassy Pond Sill and the BAM Sequence. The gold mineralisation is commonly observed in drill core to exist as visible gold that is hosted by very thin, foliation-parallel quartz-rich veinlets, hosted by highly fissile ultramafic sediments of the BAM Sequence, or by foliated rocks of the Grassy Pond Sill. Metallurgical studies completed to-date indicate that 98% extraction of gold is achievable with conventional milling, grinding to 100% passing 212 micron followed by gravity separation (+65%) and cyanide leaching. Reagent consumption was very low with cyanide consumption at ±0.40 kg/t and lime consumption at ±0.60 kg/t. This BAM Gold Deposit has the potential for the initial development to be progressed as a low cost, bulk tonnage, open pit operation. Click to download the 2019 NI 43-101 Preliminary Economic Assessment (PEA) For The BAM Gold Deposit. Click to download the 2019 JORC Report on the Resource Estimate For The BAM Gold Deposit. Click to download the 2018 JORC Report on the Resource Estimate For The BAM Gold Deposit. Click to download the 2018 NI 43-101 Technical Report on the Resource Estimates For The BAM (East) Gold Deposit, The B4-7 Deposit, and The VW Deposit. Click to download the 2017 NI 43-101 Technical Report on the Resource Estimate For The BAM (East) Gold Deposit. 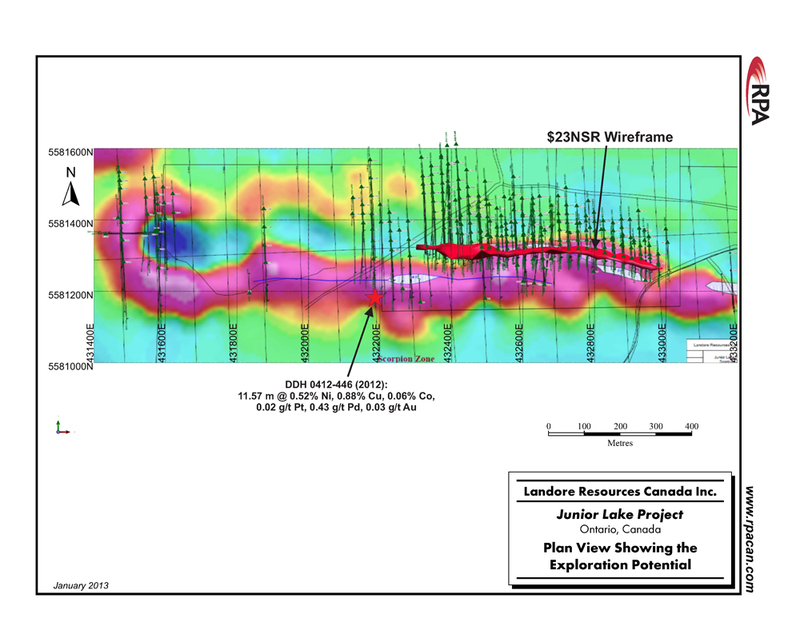 The B4-7 deposit is located in the centre of Junior Lake's mining lease area, approximately 3 kilometres to the northwest of the VW deposit. The B4-7 deposit mineralisation is hosted within a sub-vertical massive sulphide vein with stringers, net-textured and disseminated sulphides in the immediate hanging wall. The B4-7 deposit outcrops at surface with the upper 150 metres of the deposit being amenable to lower cost open pit mining. Below 150 metres, the grade improves sufficiently for underground mining. The deposit has now been delineated over 800 metres of strike length with the B4-7 massive suphide mineralisation remaining open to the west along strike and down dip. An upgraded resource estimate for the B4-7 Deposit has been recently completed in 2018. The total resource has been increased to 3,292,000 tonnes at 1.20% Nickel equivalent (NiEq) in the Indicated category and 568,000 tonnes at 1.26% NiEq in the Inferred category for a total of 46,661 tonnes of contained metal. An Exploration Target has been identified down dip from the above resource containing a potential 1.5 Mt to 2.0 Mt of sulphide mineralisation of similar grade range to that which has been outlined to-date (potential 18,000 to 24,000 tonnes of contained metal). During 2012, infill and extension drilling was conducted on the eastern and western portion of the B4-7 deposit aimed at enlarging and bringing Inferred portions of the deposit to Indicated resource category. A total of 96 NQ size diamond core drill holes from 0412-367 to 0412-362 and 5 re-entry drill holes, for 22,827 metres, were completed. The program was highly successful, the results of which are reflected in the current resource estimate. Preliminary metallurgical studies completed in 2010 indicate the nickel concentrate grades and recoveries of 13.5 per cent. Ni at 53 per cent. recovery with 17 per cent. Cu at 87 per cent recovery is achievable. Marketable concentrate can be achieved with further processing stages to upgrade the nickel, copper and PGM content with the rejection of pyrrhotite. Click to download the 2013 NI 43-101 Technical Report on the Resource Estimate For The B4-7 Deposit. Click to download the 2010 NI 43-101 Technical Report on the Resource Estimate For The B4-7 Deposit. The distinctive geophysical magnetic anomaly which hosts the B4-7 deposit together with the B4-8 prospect extends 500 metres to the east of the 00 base line of the B4-7 deposit and extends 1,000 metres to the west of 00. There, it is truncated by the Juno Lake shear, and curls north and then to the east around a prominent 150 metre diameter magnetic low. Exploration drilling has established that this zone hosts a collective potential massive sulphide mineralisation strike length of 1.5 kilometres. A deep penetrating ‘Direct Current Induced Polarization’ (DCIP) and Magnetotellurics (MT) survey has been completed on the Scorpion Zone (fall 2012). Results of the DC Resistivity section of the survey received to date are highly promising indicating the potential extension of the B4-7 mineralisation to line 800W. The B4-8 prospect is situated directly west of the B4-7 Nickel-Copper-Cobalt-PGEs deposit. Drilling in 2011/2012 discovered elevated nickel-copper intercepts on the B4-8 prospect potentially extending the B4-7 massive sulphide mineralization a further 800 metres to the west. 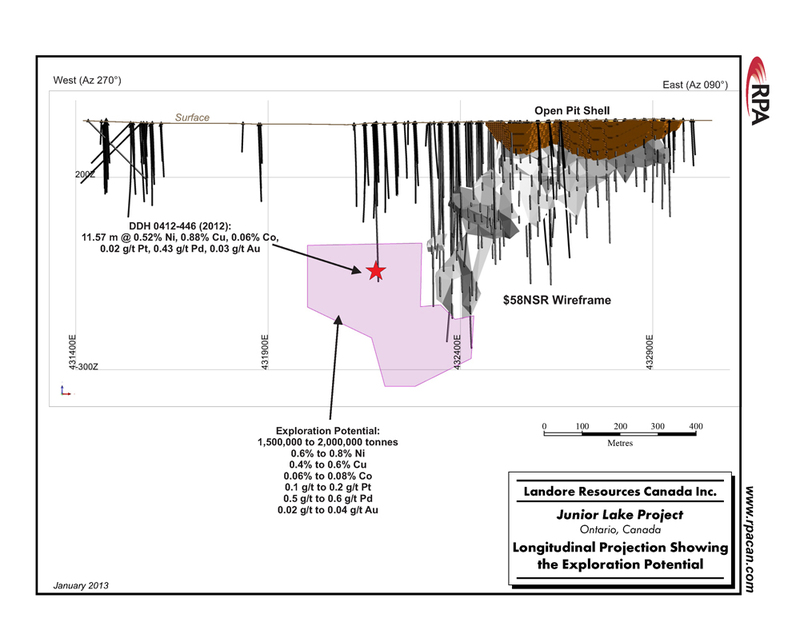 2012 drill-hole 0412-446, located within the B4-8 prospect, intersected B4-7 massive sulphide mineralisation with grades of > 1% nickel and > 1% copper plus significant credits of cobalt and platinum group metals. 2011 drilling on the B4-8 prospect has indicated significant copper mineralisation in the vicinity of the shear's deformation zone on the 900W line with drill-hole 0411-323 reporting 25.68 metres at 0.66% Cu including 10.01 metres at 1.17% Cu together with 0411-328 reporting 12.64 metres at 1.01% Cu. There has been a notable increase in the copper content and grade as drilling progresses to the west. The VW Nickel deposit (VW deposit), discovered by Landore in late 2005, is located at Ketchikan Lake in the central part of the Junior Lake. 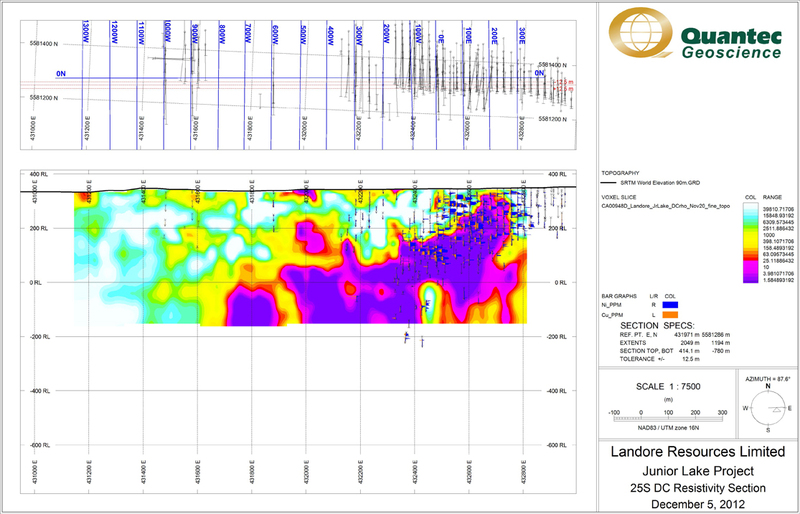 From 2005 to 2010, Landore has drilled 142 diamond NQ size holes for 35,339 metres on the VW deposit. The VW deposit outcrops at surface with the upper 150 metres of the deposit being amenable to lower cost open pit mining. Below 150 metres, the grade improves sufficiently on the main Katrina zone for underground mining. Indicated – 1.08 million tonnes at 0.71 per cent. NiEq. Inferred – 0.18 million tonnes at 0.68 per cent. NiEq. Metallurgical studies completed in 2008 indicate the nickel concentrate grades and recoveries ranging from 14 per cent nickel at 74 per cent recovery to 10 per cent nickel at 80 per cent recovery are a reasonable representation of the expected plant recovery. Click to download the NI 43-101 Technical Report on the Resource Estimate For The VW Deposit. The city of Thunder Bay is located on the northern shore of Lake Superior and is the main supply hub for the mining centres of northern Ontario including Red Lake, Pickle Lake, and the Musselwhite gold mine. It has extensive port facilities and an airport providing daily flights to major provincial cities, as well as a rail line that provides access to both eastern and western North American markets. Access to Junior Lake from Thunder Bay is via a sealed highway for 235 kilometres to the town of Armstrong and then via a well maintained forest products unsealed road for 100 kilometres that runs to the property. The Canadian National Railway runs parallel to the Junior Lake property 13 kilometres to the south providing direct transport access to both the nickel smelting centre of Sudbury and the port facilities at Thunder Bay. In addition, Junior Lake has abundant water resources nearby and is just 10 kilometres from the planned hydro-electric power station on the Little Jackfish River. Golder Associates of Sudbury, Ontario, have continued with the Environmental Baseline Studies programme initiated on the mining leases containing the B4-7 and VW deposits in the winter of 2007. Water surface monitoring of lakes and drainage tributaries within the vicinity of the deposits have continued on a bi-annual basis during 2011, and have been increased to a quarterly basis in 2012. The area of influence has recently been expanded to include lakes and drainage further out from the leases. The environmental and baseline studies are all pre-requisite for permitting requirements for the development of the BAM Gold deposit, B4-7 and VW deposits. A pre-requisite for the development of the BAM Gold deposit, B4-7 and VW Nickel deposits is to secure tenure over an area of land sufficiently large to provide for development, mining, processing, infrastructure and buffer zones around the mining areas and for future expansion. Landore has been granted three mining leases, which include mining and surface rights, over an area encompassing the B4-7 and VW deposits. The leases cover 23 existing exploration claims for a total area of 3,729 hectares and have been granted for 21 years renewable for further terms of 21 years. Sink shafts, excavations etc., for mining purposes. Construct dams, reservoirs, railways etc., as needed. Erect buildings, machinery, furnaces, etc. as required and to treat ores.